Susan Daffron is the award-winning author of more than 70 articles that have appeared in national magazines. 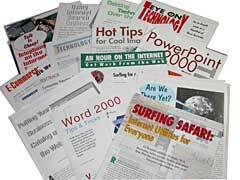 She also has written more than 200 newspaper articles, approximately 1,500 online articles, web copy, autoresponders, newsletters, and courseware for online training classes. A list of writing credits appears below. Many of the print articles are restricted by copyright, so we can’t publish copies here. 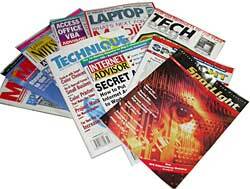 You may be able to find some articles in the archives on the magazine sites that have links below. For 3 years, wrote weekly Publishize newsletter. Past newsletter articles (300+) are archived here along with new articles, which are posted regularly. Wrote twice-monthly newsletter and blog posts for the National Association of Pet Rescue Professionals. Created multiple training courses about self-publishing for SelfPubU, author training site. Contributed articles to Computor Companion magazine (archived here). For 5 years, wrote weekly Logical Tips ezine (approximately 400 tips, most of which are archived here). For 2 years, wrote weekly Sandpoint Insider ezine (some articles archived on this site). Write guest posts for numerous writing and entrepreneur-related Web sites, including Copyblogger. the PC and Introduction to Quark XPress for the Macintosh. Each is an approximately 60,000 word training course with 12 Lessons of 5 chapters each along with FAQ, supplementary material, quizzes, pretests, and final exam. Publications International – Wrote product reviews for PDAs, PDA accessories, scanners, and image editing software for the Consumer Guide Best Buys Web Site (www.consumerguide.com). Rochester Initiative – For four years, wrote the twice-monthly Intelligencer online newsletter which was e-mailed to approximately 40,000 IT managers. Wimpy Player -Rewrote approximately 50 pages of help and sales copy for a Web site for a product that lets you put streaming media on your Web site. which are targeted towards people in the graphic design and printing industry. Association of Executive and Administrative Professionals – Wrote two computer articles and one computing “Help Desk” column for monthly Executary newsletter. Baseline Logic – Ghostwrote case study article for client to submit to industry trade magazine. Spokesman Review (Spokane, Washington), Computer columns 2006 – 2007. These columns also were part of the Logical Tips newsletter and some are now archived on this site. Weekly “Tales from the Mousepad” columns. The column began running Feb 11, 2001 and generally appeared on Sundays until it moved to the Spokesman Review in 2006 (see above). It was also available as part of the Logical Tips newsletter and many columns are now archived here. The River Journal (Sandpoint, Idaho), “Pet Tails” Columns October 2002 – 2007. Because so many people lamented the loss when Susan Daffron stopped writing about pets in the local newspaper, the River Journal picked it up. The column was also available at the Pet Tails site and is now archived here in the pet section. In late 2006 the River Journal also started running Susan’s Web Business column. Bonner County Daily Bee (Sandpoint, Idaho), “Pet Tails” Columns. Ran from April 1998 – June 2000. Pet care articles focusing on pets adopted from animal shelters (see above).